Did you know that over 87 percent of marketers use social media marketing? Social media marketing is crucial to your business’s digital marketing success. A key component of having a successful social media campaign is using the right social media management tools. In this post, we’ll share four of the best social media management tools for running your campaign. Buffer is a great social media management tool for your business. This top social media management tool is used by companies like Microsoft, Trello, and Shopify. As you can see above, Buffer offers numerous plans to fit your business’s needs. The cost for each plan increases with the number of social accounts and the number of users on your account. You can use Buffer with Facebook, Twitter, Instagram, Pinterest, and LinkedIn. Publishing queue: Buffer allows you to schedule and ad posts to a queue. You can schedule posts and Buffer will automatically publish them for you at your preferred times. Engagement: Buffer offers a reply feature that enables you to reply to Facebook, Twitter, and Instagram comments. It costs extra to add this to your plan, but it’s a great way to interact with your audience through your social profiles. Analytics: Whenever you run a social campaign, you want to monitor the results to know it’s working. With Buffer’s analytics, you can see how your posts are performing and understand how to improve your results. Team features: Buffer allows you to add multiple team members to your campaign so more people can work on it. You can have up to 25 team members and grant them different access levels depending upon their position. Buffer is one of the best social media marketing tools your business can use for your campaign. 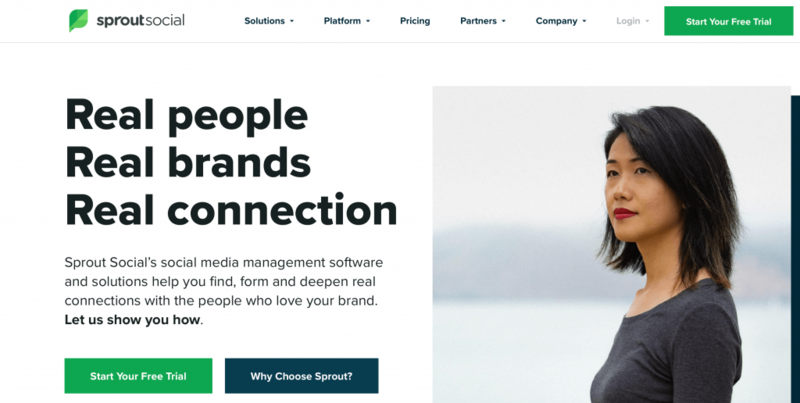 Sprout Social is another top social media management tool. Companies like Glassdoor, American Lung Association, and GrubHub utilize this tool for their social campaigns. It’s one of the top social media management tools that supports Facebook, Twitter, Instagram, and LinkedIn. When you use Sprout Social, you can schedule, monitor, and analyze your campaign’s results. Analytics: Sprout Social allows you to analyze your campaign’s performance. It gives businesses the ability to view individual statistics on each post. This lets you break down your posts to see how they are performing, and which ones engage your audience the most. Social inbox: With this social tool, you get a social inbox. You can filter messages and respond as necessary. Social monitoring: Sprout social is great for monitoring each social network. It also allows you to track your brand on social media by using keyword searching features. Engagement: You can easily scale and monitor your campaign’s engagement with a unified inbox. The tool helps you to see how your campaigns perform across all platforms. Sprout Social is a viable option for your social media management needs. Hootsuite is one of the best social media management tools for companies today. This big-name social media management tool has clients such as Visa, PennMutual, and Accor Hotels. You can obtain this tool through numerous types of packages. Each package offers either a 30-day trial or a demo, which allows you to test the program before you use it. It’s a great way to see if it’s the right tool for your business. This top social media marketing tool connects with Facebook, Twitter, Instagram, LinkedIn, YouTube, and WordPress. Applications: You will organization, scheduling, and RSS integration with this tool. One of the best features is the ability to upload your content in bulk. This means you can upload and schedule dozens of posts in one shot. Content curation: Hootsuite makes it easy for you to find and manage compelling content on social media. You can manage text posts and photos that are posted on social media platforms. Analytics: You’ll get great insight into your campaign’s performance with Hootsuite’s analytics. You can see how your campaigns are performing on different social media sites. Team management: Hootsuite allows you to assign team members to tasks and approve their workflows. It gives you more control over your team and how they work. Hootsuite is an excellent social media marketing tool to help you manage a variety of social platforms. SocialPilot is another great social media marketing tool you can use to manage your social campaigns. This tool connects with big platforms like Facebook, Twitter, Instagram, Pinterest, LinkedIn, and Tumblr. Bulk-publishing: Similar to Hootsuite, SocialPilot allows you to publish multiple social media posts at a time to make it easy for your busy schedule. Auto-publishing: SocialPilot will automatically publish your scheduled posts for you too. Analytics: You can easily analyze, monitor, and report your social media performance with this tool. SocialPilot offers analytics tools that monitor your campaign. You can download this data into one, simple PDF to help you understand your results. Inboxing: With SocialPilot, you can be on top of all your conversations. SocialPilot makes it easy for you to respond to comments, messages, and posts across Facebook pages. You can moderate your pages in real-time. SocialPilot is a great social media marketing tool to help you manage your campaigns. Now that you’ve looked at social media management tools, you may start to wonder which is better for your business: social management tools or social media marketing services. Let’s dive in and analyze the differences. One of the most significant differences between social media marketing tools and social media marketing services is who works on your campaign. When you use social tools, you have to rely on yourself or your marketing team to run your campaign. With social media marketing services, you focus on running your business. You don’t have to worry about taking the time to monitor your campaign and create posts. It’s a great option if you’re too busy running your business. Another big difference is expertise. If you’ve never run a social media marketing campaign, it can be a challenge to know how to create posts that drive results. With social media marketing services, you have a team of experts working on your campaign. You can trust that your campaign will drive results because you have experts working on your campaign. Your money will be better spent when you invest in letting experts develop and manage your campaign. Social media marketing tools are great for helping you run your campaign. When you choose a social media marketing company, you’ll get social marketing tools in your package. It’s all wrapped up in one price! If you’re looking to focus on running your business while reaping the benefits of social media marketing, consider choosing social media marketing services to help you drive the strongest campaign with the biggest results. The right social media management tools will make managing and launching your social media campaign easier for you and your team. You’ll reach more valuable leads and manage your campaign better. If you’re looking to make your social media management even more manageable, contact us online for more information regarding our deliverables and social media marketing services.